The Oregon Secretary of State’s Office Elections Division extended to 2015 Chaves Consulting’s Customer Help Desk contract to support the State and Oregon County Clerks’ using the Oregon Centralized Voter Registration (OCVR) software application and its data centers. CCI has provided OCVR support since its implementation nine years earlier. Oregon Health Authority extends Chaves Consulting’s insurance verification contract to help more Oregonians access insurance and health care. Oregon Secretary of State contracted with Chaves Consulting’s and Arikkan’s Synergy Data Center to provide additional data center services to enhance data back up and disaster recovery for state-wide Elections IT solutions. Oregon Trail Electric Consumers Cooperative (OTEC) expands Chaves Consulting’s Mail Preparation Agreement to enhance support for the OTEC Board Elections with ballot re-design, new elections info and assisting the OTEC Elections Committee to tally Board election results. The State of Iowa extends its contract with Chaves Consulting and Arikkan to support the software application, database and infrastructure for Iowa’s statewide voter registration solution. The State of Missouri contracts with Chaves Consulting and Arikkan to enhance and deploy online voting capability for deployed soldiers, military and other eligible overseas voters. The solution integrates Democracy Live’s Live Ballot technology to allow overseas voters to visit a user-friendly business portal and electronically request voter registration applications and absentee ballots. State Archivist transitions successful Oregon Records Management Solution (ORMS) state-wide Pilot to production. Nationally-recognized public-private partnership between Oregon Secretary of State Archives, Chaves Consulting and Arikkan leads the nation in cloud-based implementation of HP TRIM/Records Manager. Oregon Health Authority awards an additional contract to Chaves Consulting expanding customer contact center support and insurance verification for Oregon Health Plan and Cover Oregon customers. Contacts expedite access to health insurance for Oregonians while adding capacity to serve State agencies’ clients. Oregon Health Authority awarded a contract to Chaves Consulting for customer contact center support to verify third party insurance coverage (TPL) for Oregonians enrolling in the Oregon Health Plan. Chaves Partnered with WorkSource Oregon in an exclusive recruitment, hiring customer-service-oriented people and creating 18 new jobs. Oregon Secretary of State Archives Division extended the ORMS Master Services Agreement through 2015. The State of Wyoming awarded Chaves Consulting and Arikkan a contract to implement and support a multi-year Wyoming Record Management Application (RMA) Project for the State of Wyoming Archives, State Parks and Cultural Resources and other State agencies. The State of Iowa contracted with Chaves Consulting and Arikkan for development of an on-line Election Night Reporting (ENR) application. The State of Iowa awarded a contract to Chaves Consulting and Arikkan for Application and Infrastructure Support of I-Voters, Iowa’s Statewide Voter Registration and Elections Management System. Washington’s Secretary of State’s Office Archives Division agreed to pilot Oregon State Archives, Chaves Consulting and Arikkan’s Oregon Records Management Solution (ORMS), funded by a federal grant from the National Historical Publications and Records Commission. Wall Street Journal’s MarketWatch: State of Oregon Embraces HP TRIM for Statewide Cloud-based Records Management Program. 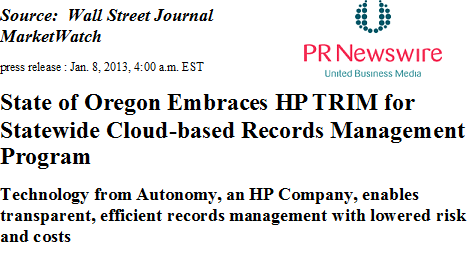 Called Oregon Records Management Solution (ORMS), the cloud-based system is the result of a unique public-private collaboration between Autonomy, Chaves Consulting and Arikkan, utilizing HP TRIM to implement the first statewide electronic records management solution of its kind in the country. ORMS implements HP TRIM in the cloud as part of a Software-as-a-Service solution to make access to government records easier, more transparent, and affordable. Government Computer News: Oregon rides cloud to statewide records management system. A cloud-based records management system in the office of Oregon’s Secretary of State produced such improvements in access and processing time that officials are now expanding it statewide. The Oregon Records Management Solution (ORMS) will let state, city and county agencies manage and provide access to records in an efficient, uniform manner and will save money on storage, risk and litigation costs, officials said. 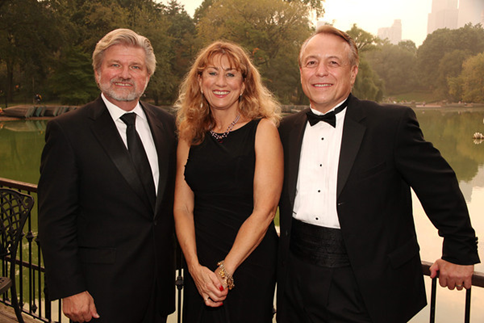 Ten Best Companies: Chaves Consulting, Inc. (CCI) was honored as one of the 2012 Ten Best Companies Supporting the Arts in America (BCA 10) at a gala event at New York City’s famed Central Park Boathouse. It is only the third time that an Oregon company has been chosen for the prestigious business leadership award, and the only company from the West Coast chosen in 2012. Chaves Consulting and Arikkan welcomed the City of St. Helens and Lane County to ORMS as Early Adopter Agencies. Chaves Consulting and Arikkan’s Election Night Reporting (ENR) online solution delivered Election Night results for the 2012 General Elections in the State of Missouri. Chaves Consulting and Arikkan contracted with the Oregon Public Utility Corporation to design and develop an interface to link OPUC’s various Business Applications with ORMS. Chaves Consulting and Arikkan contracted with the Oregon Secretary of State to provide additional data migration services to move data from SOS’ current records management system into the ORMS private government cloud. The State of Oregon awarded Chaves Consulting and Arikkan a multi-year contract to provide the innovative Oregon Record Management Solution (ORMS) for State and Local Government agencies, Cities, Counties, and Special Districts. Oregon’s Secretary of State Kate Brown launched ORMS at the State Archives with 10 Pilot Agencies signing agreements. Agencies included: the Oregon Public Utility Commission, City of Milwaukie, City of West Linn, Department of Human Services, Department of Energy, Tualatin Hills Parks and Recreation District, City of Hillsboro, City of Beaverton, City of Dundee and Tillamook County. Chaves Consulting and Arikkan contracted with the Oregon Secretary of State’s Office to provide data migration services to move data from their current records management system in to ORMS. Chaves Consulting partnered with Arikkan Inc. to build the state-of-the-art Synergy Data Center in Baker City, Oregon. Oregon Business Magazine: Thinking big in Baker - Tiny, beautiful Baker City has, like most rural Oregon towns, long struggled to create new business and jobs out of the ashes of its natural resources industry. The seat of a remote county with a population of only 16,000, Baker suffers from high unemployment but it does not suffer from a lack of trying…. Now CCI and several partners plan to open in late July a new data hosting center in the historic Baker Tower that Richard Chaves hopes will finally bring the rest of those 100 jobs to town. Data center to open in Baker Tower - Richard Chaves and his partners are investing $1 million to launch Synergy Data Center and Services in the historic Baker Tower building, with hopes of eventually bringing 100 high-tech jobs to Baker City. Chaves said three Oregon companies, including his own, Chaves Consulting of Baker City, along with Arikkan Inc. of Salem are forming Synergy Data Center and Services (Synergy DCS).